This is the final post in a mini-series. The two previous posts looked at organisations which decided to join Big Flame. This one is about a group which didn’t, despite a lot of discussions and the hopes of some in BF. Like the other two organisations, it came from a very different political background to BF. In this case, the International Socialists tradition. The International Socialists (IS) were the forerunners of the Socialist Workers Party (SWP). The name change came in 1977. Before that in 1973-74 the IS leader, Tony Cliff, initiated a series of changes. A new emphasis on “young workers” rather than shop stewards, and what was presented as the need for the group’s paper Socialist Worker to become more popular. Jim Higgins was removed as National Secretary, Roger Protz as the Socialist Worker editor, and a number of others from the Executive Committee. Looking back later, opponents of the leadership saw these moves as preparations for the redefinition of IS as a party. There are two articles which discuss the events of these years: More Years for the Locust: the Origins of the SWP by Jim Higgins, available at both marxists.org and andyw.com, and The Making of a Party? The International Socialists 1965-1976 by Martin Shaw, which was originally published in the 1978 edition of the Socialist Register. The opponents of the changes declared themselves as the International Socialist Opposition (ISO) in 1975. By May that year 135 IS members had indicated their support for its platform. Their position was lost at the IS Conference that year (new arrangements for appointing delegates were introduced which the ISO saw as a manoeuvre to limit their numbers). At the end of the year the ISO’s leaders were expelled, and many others followed them out of IS. Some commentators have drawn attention to the fact that those who became the ISO had supported, or at the very least not opposed, previous expulsions from IS: the Trotskyist Tendency in 1971, and the various currents called by their opponents the “Right Opposition” in 1973, (these groupings survive today as the Alliance for Workers Liberty, and partly through the Revolutionary Communist Group). Of the several hundred people who left IS following the expulsion of the ISO, about 150 formed a new group called the Workers League (WL). It included Roger Protz, John Palmer and (for a time) Jim Higgins. 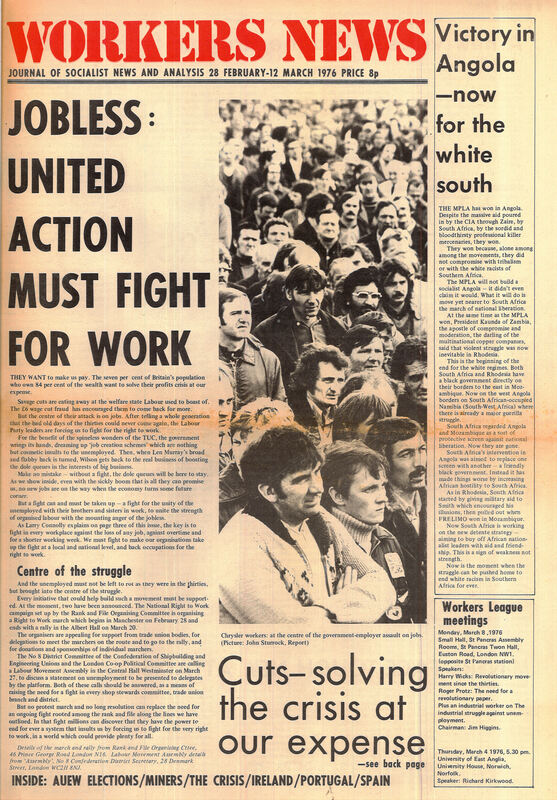 It published its own paper Workers News (first issue in Feb/March 1976), later renamed Socialist Voice. Shaw writes of WL: “Although it expected to quickly double its original 150 membership with further refugees from the SWP, it failed to project itself as a political alternative and in fact recruited very few. Its leaders were initially committed to the “workerist” politics of IS in the early ’70s, although very slowly as their membership declined a re-valuation of some key questions began to take place. Very many more IS members left as individuals, rather than with the ISO. Among the intellectuals, there were a number who were critical of the organisation’s degeneration, but it was here perhaps that there entered an element of farce: there was no concerted protest, and a number left as individuals while others made their peace with the leadership”. Not only did the WL not grow, but it seems to have started losing substantial numbers fairly soon, long before the ISA was established. One explanation which has been advanced suggests that it never saw itself as a new political group, but as an external faction to influence the SWP, and it was soon clear that this strategy was a hopeless one. Within a couple of years those remaining in WL dissolved themselves into a new grouping. This was established at a conference of International Socialists and Revolutionary Unity in February 1978. Martin Shaw (who wasn’t in WL) seems to have been one of the main movers. The conference established the International Socialist Alliance (ISA) This was more of a network than a membership organisation, and spent a lot of its time talking to the IMG (International Marxist Group) and Big Flame, discussing the steps towards regroupment. The people signed the call for the International Socialists and Revolutionary Unity conference were: Bob Cant, Ray Challinor, Tony Clark, Celia Deacon, Soonu Engineer, James Hinton, Richard Hyman, Hugh Kerr, Richard Kirkwood, Richard Kuper, Stephen Marks, John Anthony, Mary Pearson, Gordon Peters, Pete Sedgwick, Martin Shaw, Mike Sheridan, Leni Lolinger, John Whitfield, Granville Williams, John Whitfield, and Harry Wicks. I don’t know how many of them stayed after the conference. There were over 150 at Revolutionary Unity conference. The first two ISA conferences were attended by 50 to 100 persons. Towards the end the numbers involved in the ISA were much smaller. When the ISA was formed, the prevailing view was against fusion with the IMG unless wider forces were involved. As numbers dwindled and IMG pushed strongly for regroupment, the views of some changed. Back in 1978 Big Flame hadn’t agreed to sign a declaration intended to lead to fusion between it and the IMG and ISA (see Episode 24 in the Big Flame history series). Then in 1979 it rejected another approach from the IMG for fusion. 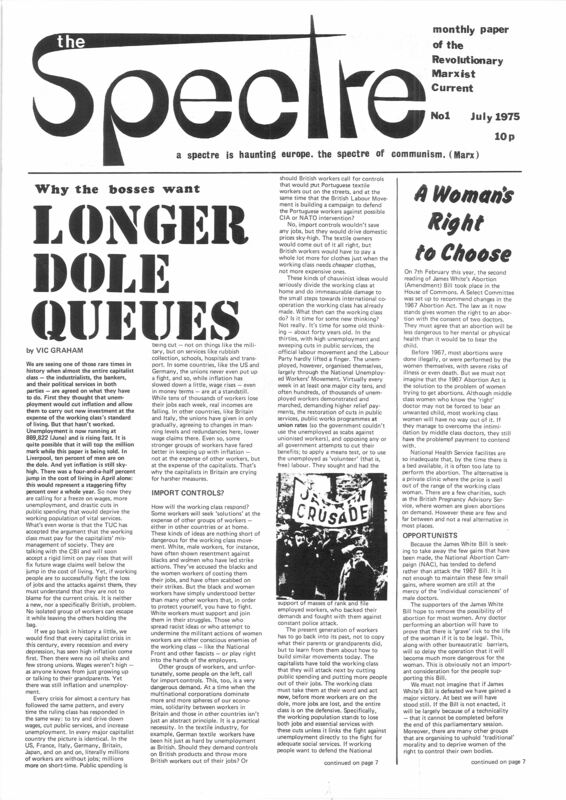 The ISA dissolved in November 1979, and according to both the final ISA bulletin and an issue of Socialist Challenge newspaper of the time, two caucuses had formed. One of people considering joining the IMG, and the other considering BF. In various places BF writers had acknowledged the positive contribution of the IS tradition to the revolutionary left in Britain, for example, seeing some parallels with mass politics in “the IS tradition’s break with orthodox Trotskyism, which particularly enabled them to re-analyse post-war relations between reformism, working class consciousness and organization” (“Has Big Flame got a Future?” Internal Bulletin October 1978). In 1977 at the time of the Project for a New Revolutionary Organisation (see Episode 11) amongst the various groups flagged up as targets for discussions was a group of ex-IS members in Coventry. About half a dozen of them, including Roger Klein, decided to join BF in late 1978 (as far as I know they weren’t involved in the ISA). They all appear to have left by the early 1980s. During the last few months of the ISA, this document was produced by BF addressed to ISA supporters (dated October 1979, it was also published in a BF conference bulletin): Big Flame contribution to the ISA post-conference bulletin. The document sets out at length a history of BF’s relations with the IMG, and some political differences between BF and the IMG. It argues that the previous two years had seen BF “move politically towards more ‘classical’ positions” on such issues as voting Labour and the importance of trade union work. It goes on to suggest that ISA supporters could “enrich and to a certain extent help transform BF”, and could survive politically and personally in BF’s “healthy internal life”. The document concludes “we hope that as many IS supporters as possible who agree with the general approach of BF” will participate in the ISA caucus discussing BF. The November 1979 Big Flame National Committee heard that some ISA members would probably join BF “quite soon”. I can find no further mentions in old BF documents. I don’t know what happened to the ISA BF caucus, and can’t find anyone who is able to help me. At least two people who attended ISA meetings (one in Haringey and one in Leicester) did join BF (Gordon Peters was one), but apparently as individuals rather than through any caucus. If others did join in this way at the very end of the ISA, they were clearly few in number and probably didn’t stay in BF that long. Those who had been involved in the ISA went in many different directions. A few did join the IMG (e.g. Steve Marks, Jonathan Baume), some the Labour Party (e.g. Martin Shaw), some put their efforts into the Socialist Society (e.g. Richard Kuper, John Palmer). Most seem to have carried on as independent socialists or left active politics. Why did so few ISA members join BF? The reasons why Big Flame was not a particularly attractive option can be found in a series of articles in an ISA Bulletin from 1979. On the one hand BF had “improved enormously last couple years”, evolving from what was seen as “naïve anarcho-libertarianism”. It was “more open” than the IMG. On the other hand it tended to have “a rather sectarian approach toward the IMG”. It was “very small”, its “influence patchy”, and “been in somewhat of a mess of late” losing working class and women members. For people who had set out hoping to achieve a large scale unity project, there can have been little attraction in joining a tiny group of around 150. Particularly when their past experience was in a group of over 3,000 members. This post is the second in a mini-series about other political organisations which decided to join Big Flame. The group discussed in the previous post had its origins in Trotskyism. The background of this one was Anarchism. When the Libertarian Communist Group (LCG) joined Big Flame in 1980, two members wrote an account of their group, which has been very useful in putting together this post: A Short History of the Libertarian Communist Group (from 1980 Conference documents). Also worth reading are some accounts of the same history from a more critical perspective. Written many years later, from within the anarchist movement, they are Anarchist Communism in Britain (available both on the libcom site and the afed one), and In the Tradition. The Anarchist Federation of Britain (AFB) has an extremely long history, and always contained within it a large variety of differing and opposing ideas. In 1971 the Organisation of Revolutionary Anarchists (ORA) was founded as a ginger group within the AFB, but soon left. ORA’s criticisms of the AFB were mostly organisation rather than theoretical, but it started to develop a class struggle perspective. I have seen different figures quoted for the maximum number of members achieved by ORA – from the 70s up to the 100 mark. It produced an agitational newspaper Libertarian Struggle. ORA suffered from a series of losses of membership, some to Trotskyist groups, and by the mid 1970s came to something of a standstill. In 1975 it changed its name to the Anarchist Workers Association (AWA). In 1976 the AWA had around 50 members, and the paper was called Anarchist Worker. An important influence of the developing politics of the group was “The Organisational Platform of the Libertarian Communists”. This was first published by a group of Ukrainian and Russian anarchists in Paris in 1926. It was reprinted in France in 1972, and in 1977 the AWA brought out an English edition. The Platform is available with background material on the internet at The Nestor Makhno Archive. The AWA’s “Aims and Principles” stated: “Capitalism is a class society” and “the position of the working class as the collective producer of society’s wealth makes it the only force capable of replacing capitalism by a classless society”. On the role of the AWA this document said: “The task of the AWA is to aid the preparation of the working class for their seizure of power. The establishment of an anarchist society is something that has to be consciously fought for by the working class. … The AWA aims to offer a lead within the working class movement by example and explanation. … The AWA does not seek independent power for itself but seeks to work through the working class organisations”. Between 1976 and 1977 there was a bitter split. The immediate issue under dispute was Ireland. The AWA opposed internment and favoured the withdrawal of troops (but not immediately and only as a result of united class action), and was strongly opposed to the IRA (“we reject all para-military groups as nationalistic, elitist and divisive”. A grouping which emerged with the AWA – the Towards a Programme Tendency (TAP) – labelled this position “absentionist”, and took the line of the Troops Out Movement. For more information on the issues at stake, see this document written by a former LCG member for a conference in 2004: Coalitions, Libertarian Communism and Ireland. The dispute was about other issues than Ireland. TAP also argued for a less “ultra-left” position on the unions favouring their “democratisation”. According to the Anarchist Communism in Britain article mentioned above “The TAP tendency accused their opponents of “traditional anarchism” and wishing to “lead the AWA back to the days of the AFB” whilst the TAP tendency was accused by its opponents of “Trotskyism”. One former LCG member who later joined Big Flame recalled recently that the situation was “two quite incompatible philosophies co-existing in the same organisation. The non-TAP tendency seemed to me like religious fundamentalists, insisting on the letter of their sacred texts no matter how irrelevant or impractical in the real situation of the time”. At the May 1977 Conference TAP supporters had a majority. Apparently without prior notice they proposed a motion expelling their opponents, which was carried. The expulsions were later defended on the ground that those expelled “had reached the stage of behaving in a wilfully disruptive manner” and that life for the AWA “would have proved impossible had the people concerned continued as members” (“We Reply” in Libertarian Communist no3). Others have argued that the split was badly handled and took the course it did because of a lack of a tradition of political debate in the AWA. In 1977 there was another name change: the organisation became the Libertarian Communist Group (LCG), and after that the paper was renamed Libertarian Communist. An article in the October 1977 issue of Anarchist Worker “What is in a Name … Why We’re Changing” said that while the AWA had developed out of traditional anarchism, this had fossilised. It affirmed its allegiance to working class revolution, and acknowledged that Marx had made a “great historical contribution”. The new name proclaimed an identity with other groups on the continent who described themselves as libertarian communist. There were seven issues of Libertarian Communist in A3 newspaper format (the first dated Jan/Feb 1978) and one in A4 journal format. The new paper continued the tradition of the Anarchist Worker in supplementing short news stories with the centre pages devoted to an interesting extended feature: Russia 1917, France 1968, Spain 1936, Germany 1918-1919 and so on. The article mentioned above from issue no 3, accepted some criticisms of the paper: insufficient space devoted to sexism and patriarchy, or “quality of life”. From 1977 onwards the LCG never had more than 20 members, and numbered about 16 in August 1980. They decided that they were too small and lacked adequate collective practice. This led to the decision to join Big Flame. To others in the anarchist movement the LCG, and its predecessors, were “Anarcho-Trots” or a form of “Bolshevised Anarchism”. They were accused of “leftism” – tailing leftist organisation. Particular objection was taken to their position on Ireland, their participation in elections through Socialist Unity and, of course, their decision to join Big Flame. In the words of In the Tradition mentioned above “the short-lived Libertarian Communist Group also displayed Leninist and reformist tendencies that would eventually see their abandoning libertarian politics”. The Big Flame Conference in December welcomed the LCG’s decision to fuse. About 10 LCG members joined BF. 5 others decided not to do so (1 of whom a few years wrote an article in the Discussion Bulletin as a BF sympathiser). Within a year, 2 of those who joined BF had left, feeling it lacked “cohesive politics”. Several never became that active in the organisation. In part this was due to their geographical location. Those in London and Norwich were able to join local BF groups (as did someone from York who moved to Birmingham). Others, for example those living in Lancashire and Middlesbrough, found themselves isolated. These notes of a meeting 10 months after joining BF provide an interesting account of the experience of BF: Report of a Meeting of ex-LCG Members (from October 1981 Discussion Bulletin). A handful of former LCG members were very active in BF. At different times two of them were part of the BF National Committee (NC). Ex-LCGers were active in a number of BF Commissions e.g. Irish and the International, and helped produce the newspaper. Like ex-Revolutionary Marxist Current members (see post on the RMC), former LCG members identified with one of the two main political currents in the organisation, joining the Emerald Street Tendency (see a future episode – Episode 27). Therefore, contrary to the comments on some other websites, the former LCG members were not part of the BF minority which left the organisation in 1981 to join the Labour Party. In May 1984 Big Flame effectively ceased to be a national organisation, with only 17 people carrying on under the name (see another future episode – see Episode 30). Two of these 17 were previously in the LCG. At least one former LCG member has returned to class struggle anarchism. He lasted less than a year in Big Flame, and later helped form the Anarchist Communist Federation in 1985. It has since become the Anarchist Federation. This post is the first in a mini-series about other political organisations which decided to join Big Flame. The Revolutionary Marxist Current (RMC) joined Big Flame in 1977. Its origins were in the Trotskyist movement. Specifically the International Marxist Group (IMG). When members of the RMC began a period of joint work with BF in July 1977 a couple of joint Internal Bulletins were produced. One of these contained a brief history of the RMC written by members. Here it is: About the Revolutionary Marxist Current. In May 1972 there was a fusion conference between the IMG and a separate youth movement it had established, the Spartacus League. At this conference some key figures from the IMG’s leadership over the previous period (e.g. Pat Jordan, Bob Purdie) were replaced by others. Several of these were originally part of the IMG’s Oxford branch, and had written a historically important document proposing a modified course two years previously. Two of them – John Ross and Bob Pennington were to be key members of the leadership of the IMG and its successor the Socialist League (SL) for many years to come. I find it difficult to get a handle on the different political positions in 1972. In part because what happened was not an open tendency battle like the many which IMG/SL members would engage in over the coming years. Documents tended not to explicitly criticised those of other writers, and the positions emerged more in the form of nuances. The differences appear to be these: the new leaders wanted a re-orientated towards the working class, an end to eclectic leaping about from issue to issue and a proliferation of front organisations, and to cease going overboard with abstract calls to action issued to the working class (i.e. grandiose plans which were impossible to achieve, whose purpose was usually to outbid the lines of other groups). The new leadership did not stay together long. By the IMG’s Easter conference in April 1973 there were six different grouping arguing different lines, two of them formed by sections of the new leadership who had broken away. By the end of 1973 many well known figures who had been part of the new leadership were in opposition (e.g. Tariq Ali, Peter Gowan, Robin Blackburn). Another tendency, which didn’t contain such well known figures, was called the Left Opposition Tendency (LOT). 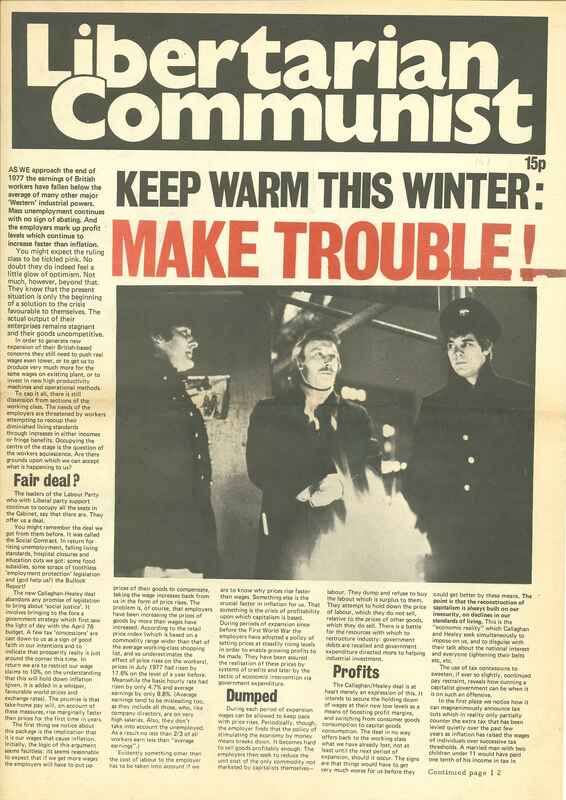 The appeal for a tendency was issued in February 1973 by a former member of the Oxford Group, who had since become a member of the IMG Political Committee and the Manchester Organiser (and later to join Big Flame). A key criticism of the new leadership was that it had now started issuing abstract calls to action to the working class, in particular repeatedly calling for a general strike to bring down the Tory government, with little consideration of the realities of the situation. For other LOT criticisms of the IMG see “About the Revolutionary Marxist Current”. At the IMG Easter Conference the LOT position came third out of six with 13.4% of the delegate votes (behind both the leadership, who retained control, and the other breakaway group from it). At an aggregate over a weekend at the end of June/beginning of July 1973 LOT decided to dissolve. Thus it had no presence at the next IMG conference in December 1973. During the course of 1974, there were multiple resignations from the IMG. Many were by former LOT supporters, although others who supported LOT stayed on and became members of different opposition tendencies in the future. The Manchester Organiser mentioned above (by now in London and running the IMG bookshop) resigned in March 1974, saying in his resignation letter that “The IMG’s political line is comical, its internal education abysmal, and its regime contemptible”. Other followed. The IMG November Internal Bulletin contained resignation letters from Manchester members, the December one, letters from Liverpool and Bolton members. Some (but not all) of the former LOT supporters came together to form the RMC. Its first Internal Discussion, with a draft constitution came out in April 1975. Between July 1975 and December 1976/January 1977 a newspaper the Spectre was published, with 16 issues in total. The “Where We Stand” statement in the paper said the following about the group’s politics: “These struggles can only be successful under the leadership of parties and of an International based on the ideas develop by Marx, Lenin and Trotsky, and we intend to play a part in the fight for such a party and such an International”. Areas in which members were particularly active were Irish solidarity, Anti-Fascism and the women’s struggles. – Late 1974 to early 1975 with Workers Fight – This group founded in 1966 is now known as the Alliance for Workers’ Liberty. – Spring to Summer 1976 with Marxist Workers Group – Formed by a split from the Bolton branch of Workers Fight in 1975. Subsequently joined the IMG. “About the Revolutionary Marxist Current” discusses the political differences which caused these regroupment discussions to fail. The majority of the RMC saw its regular paper as vital to its impact on the left and wider working class audience, and as playing a key role in keeping the group together. However, the paper became a bigger and bigger burden on the small organisation. The RMC decided at the end of 1976 to accept the view, formerly held by a minority of its members, to replace the paper by a quarterly journal. However, this didn’t happen. The RMC had failed to achieve a growth in membership. When Big Flame launched the Project for a New Revolutionary organisation in 1976/77 (see Episode 11 in the Big Flame History series), the RMC responded. In June 1977 the two organisations agree to fuse for a 2 to 3 month trail period of joint work. The actual fusion seems to have taken a bit longer, happening around December 1977. Around a dozen RMC members joined Big Flame. There were groupings in Liverpool and London with individual members in such places as Birmingham, Brighton and Nottingham. Within BF ex-RMC members developed away from Trotskyism. They also identified with one of the two main political currents in the organisation, joining Tendency One (see Episode 22), and later, when this split, the Emerald Street Tendency (see a future episode – see Episode 27). The RMC had a significant impact on Big Flame. The constitution adopted by BF in 1978 was derived from the RMC one. At different times three former RMC members were part of the BF National Committee (NC). Ex-RMCers were active in a number of BF Commissions e.g. Irish, Anti-Racist Anti-Fascist and the International Committee. Some drifted away from BF, feeling frustrated by the level of organisation in BF and a lack of ability to focus its interventions (see for example a resignation letter from the NC in a March 1979 Discussion Bulletin which refers to NC meetings “hampered by old arguments and patterns of behaviour” and the “deeper political problems of BF”; and a resignation from the organisation by another person in the June-July 1982 Bulletin which talks of the “continuing decline of Big Flame as an interventionist organisation” and how it has “failed to achieve (or even seek) a national political profile in terms of presence on national political activities”). Others stayed the course for a long time. In May 1984 Big Flame effectively ceased to be a national organisation, with only 17 people carrying on under the name (see another future episode – see Episode 30). Two of these 17 had been in the RMC in the previous decade.